Editor’s Note: Journalist Philip Moeller is here to provide the answers you need on aging and retirement. His weekly column, “Ask Phil,” aims to help older Americans and their families by answering their health care and financial questions. Phil is the author of the new book, “Get What’s Yours for Medicare,” and co-author of “Get What’s Yours: The Revised Secrets to Maxing Out Your Social Security.” Send your questions to Phil. After answering your questions here for more than four years, I can say with a mixture of authority and exhaustion that anything that helps people understand what Medicare does and doesn’t cover is a welcome development. 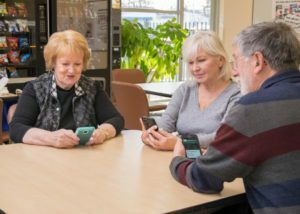 This week the Centers for Medicare and Medicaid Services unveiled a free smartphone app that helps people understand what’s covered by Parts A and B of Medicare, often collectively referred to as basic or original Medicare. Part A covers care in hospitals, nursing homes and other institutional settings; it also covers hospice care. Part B covers doctors, outpatient expenses and durable medical equipment. About two-thirds of Medicare beneficiaries have original Medicare. The other third has private Medicare Advantage (MA) insurance plans. MA plans must cover everything that original Medicare covers, but most plans cover more, including limited routine dental, hearing and vision care. 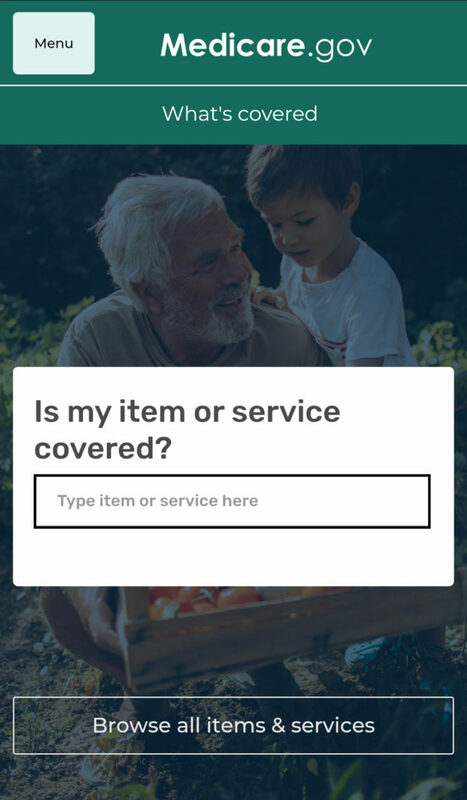 The new “What’s Covered” app does not include MA plans, so you’ll need to contact those private insurers if you have questions about what their plans cover. I have tested the app on my Android phone; it’s also available for Apple phones. The information available via the What’s Covered app can also be found at Medicare.gov, but it’s much more convenient to access it from your phone. The Centers for Medicare and Medicaid Services is stressing that the app is not the final word on what is covered. Many Medicare programs have regional differences and nuances that go beyond what the agency can convey via the small screens of hand-held devices. But this is a great start. I urge you to get the app or, perhaps, tell your adult children about it so they can download it if you need extra help. If the app leads to fewer people asking me questions, I might wind up with only a huge backlog of reader mail, and not an insurmountable one! I’m also open to any questions or problems you have about using the app. Just ask Phil. Thanks. And now, on to this week’s reader questions. Gary: My much younger spouse gets Social Security disability insurance benefits (SSDI). I’ll be turning 65 this year. Is there a way for us to maximize our family benefits where I could get a spousal benefit based on her SSDI and delay filing for my own retirement benefits until I am 70? Phil Moeller: I don’t think so. Only people born on or before Jan. 2, 1954, can still do what you suggest. For younger persons, which seems to include you, the rules are that filing for your spousal benefit also would trigger your own retirement filing at the same time, and you’d only get the larger of the two benefits. Sorry! Karen – Wisconsin: I’ve been receiving Social Security disability insurance benefits (SSDI) since 2003 when a rare spinal cord disease kept me from working. I’ve been receiving physical therapy for more than 34 years outside of my home but am at the point where it’s not safe for me to leave home. Will Medicare cover in-home therapy? I think my condition will eventually paralyze me, but therapy can delay that event. Phil Moeller: I am so sorry to hear about your problems. Medicare should cover in-home therapy, but it will need to be prescribed by a doctor. He or she may need to certify that you are unable to leave your home to receive this therapy. The State Health Insurance Assistance Program (SHIP) provides free Medicare counseling and might have someone who can help you with the details of how you can get this treatment as a covered benefit. So, if your doctor’s office is not clear on how to proceed, perhaps SHIP can help. I also work with two other Medicare nonprofits that may be able to help: the Medicare Rights Center and the Center for Medicare Advocacy. Diana – California: I’ve got a question about me and one about my mother. I am permanently disabled and on Supplemental Security Income (SSI). I worked for 38 years. When should I collect Social Security? My 80-year-old mother just lost her supplemental insurance through a divorce. Yep, that’s right, a divorce! She was awarded part of her former husband’s state retirement income, but after a year, we still don’t know what that is! It took three months for someone to inform her that she had lost her supplemental insurance three months ago! Now we are on a mission to find affordable supplemental insurance for her but are being quoted prices of more than $400 a month. My question is, how do we know if she even needs supplemental insurance? Phil Moeller: I’m not sure I fully understand either your or your mother’s situation, so please let me know if I’m making incorrect assumptions here. If you are getting SSI, you will automatically be enrolled in Social Security when you turn 62. Now, you may have already turned 62, and Social Security may have neglected to enroll you. This happens a lot, as last week’s column explained. Also, if you are totally disabled, I am surprised that you are on SSI and not already receiving Social Security Disability Income (SSDI) benefits. These benefits are larger than SSI payments. They also would have made you eligible for Medicare, and you wouldn’t have had to wait until turning 65 to enroll. It’s not clear to me what happened to your mom’s supplemental health benefits. Medigap supplemental coverage is provided by individual policies and not through any group plan that would have been affected by her divorce. Some employer retirement plans do provide supplemental benefits, so perhaps this is the plan she lost? If so, I understand that it can be difficult finding affordable Medigap supplemental insurance. I can’t say for sure whether she “needs” this coverage or not. As you may know, it pays for things not fully covered by Parts A and B of Medicare. You should review how much money her supplement policy has paid in such benefits and compare it to the costs you’re being quoted for a new policy. It’s quite possible she would be fine without one or that she might do better getting a Medicare Advantage plan instead of original Medicare. My Medicare book explains how these different types of plans work. Bob – Indiana: I’ve been helping seniors for 43 years with their Medicare and Medigap supplemental plans. I was wondering why letter plan F is going to be eliminated, at least for any new Medicare beneficiaries? Also, how much upfront government subsidy money is going to health insurance companies for their Medicare Advantage (MA) plans? 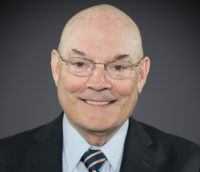 Phil Moeller: Congress decided a couple of years ago to drop C and F plans for new enrollees beginning in 2020. The reason, which you may or may not agree with, was to encourage all consumers to have “skin in the game” by dropping first-dollar coverage for Part B annual deductibles. As to the MA subsidies, provisions of the Affordable Care Act have reduced them from 14 percent since 2010, but I have not seen a good number recently. The Kaiser Family Foundation reported last year that the MA subsidy was only 95 percent of original Medicare in the quarter the country’s Medicare markets with the highest Medicare costs but 115 percent in the quarter of the markets with the lowest costs. I’m thinking the subsidy is still between 5 percent and 7 percent, but that’s an informed guess. Carolyn – North Carolina: I am 77, and every year my Medigap plan G goes up. Is it wise to change every year for a cheaper rate and does the company matter if it is not one of the popular ones? Phil Moeller: You certainly are free to change Medigap plans, but it can be very hard to find a new one. Medigap rules are set at the state level, and once a person has been enrolled in Medicare for more than six months, Medigap insurers are allowed in most states to charge them higher rates for pre-existing conditions. They can even decline to insure them at all. If you do shop for a new plan, you should pay attention to how the different plans in your area set their rates. There is a useful government guide to Medigap that explains these different insurance rates on pages 17 and 18. All plan G coverage is the same, so the popularity of the insurer should not be a factor. Barbara: I am 72, divorced, and have been on Social Security for nearly nine years. I am drawing half of my prior husband’s Social Security. It exceeded all of mine, meaning that I got about a $40 boost added to my benefit when I began claiming an ex-spousal benefit. I’m confused, however, because it looks like my benefit is not going up even though there is a 2.8 percent cost of living adjustment (COLA) taking effect this month. Can you help explain this? Phil Moeller: Your own retirement benefit has been increased because your earnings in 2017 were enough to slightly increase the size of that benefit. However, your ex-spousal benefit did not increase, and it is still the larger of the two benefits. This is why your overall benefit stayed the same. Still, I don’t see anything here that makes me think you’re being unfairly denied your COLA. It should have been applied to your overall benefit this month. If this did not happen, please let me know. Madison – Tennessee: I got married at 17. Would I still be covered by my health insurance? My mom has Medicare, and my siblings and I did too. Phil Moeller: Medicare would not cover you unless you are disabled, so I’m guessing that you have had Medicaid. If so, your eligibility could very well be affected by your marriage because your husband’s income would be included in determining your eligibility for Medicaid. Medicaid rules are set at the state level, and I’m not an expert in those rules. The State Health Insurance Assistance Program (SHIP) provides free Medicare counseling and might have someone in a Tennessee office who knows about the state’s Medicaid eligibility rules. Column: What should I do if I get a surprise Medicare bill?